Scene one: “Tomorrow we are having a corporate lunch out” he told me with an obvious tone of worry in his voice. “You know what? I was thinking… what if they take us to one of these fancy Italian restaurants that offer only pasta? I am doomed!” he stated in horror. So what? Everyone loves Italian, right? Actually… not that much. You see, my partner follows the Paleo Diet, therefore gluten is out of the question. Even though the tests say he is not a celiac (gluten intolerant) consuming gluten simply makes him feel bad. A couple of years back, if a guy told me the same story, especially a lean and fit guy like my boyfriend, I would think he is on drugs. You see, in my mind, the only reason for which someone would avoid cookies was to lose weight or try not to gain weight. Until, I met Toms, who introduced me to the Paleo diet. Scene one-oh no: Let’s go back to the corporate meal. The day came, and the message on my phone, received a bit after noon came to justify the suspicion “We are in a fancy Italian restaurant… bingo!” Oh no…that’s not good… and it wasn’t. He did eat the pasta as there were no meat dishes and the salads had a touch of… what else… pasta. And the stomach was not happy. And many more “meals” like that followed. One day, a colleague would hold a farewell lunch. Sandwiches for everyone! The other day they would have guests at the office. Wraps, sandwiches and cupcakes for everyone! The following day a conference in Manchester. Lunch for everyone at a… you guessed it… fancy Italian restaurant! Bread, bread, bread, gluten, gluten, gluten; unhappy tummy, low energy, zits saying “hi there”, happy toilet saying “come here”…you got the point. 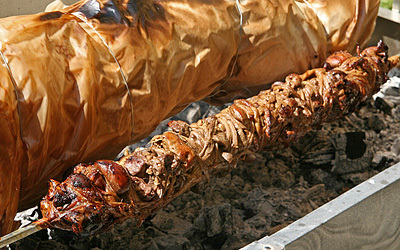 Image of Kokoretsi: a traditional Greek delicacy made of lamb’s internal organs… tasty and crunchy. Why can’t corporate meals be just like this?! I don’t know whether a gluten free diet is the best way to go or whether the Paleo Diet is ideal. What I do know, is that it works for my partner. What is certain is that the corporate life and Paleo are not very good friends!